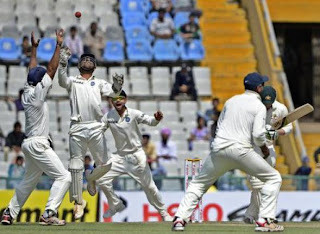 India won the test series against Australia at home by winning third test match consecutively last week of four match series. Final 4th test match between India and Australia will be played from Friday 22nd March 2013 in Delhi. India is looking to complete the white wash against under pressure Australia by winning last test match as well. Good performances by Indian spinners Ravichandran Ashwin and Ravindra Jadeja along with good batting performances by young openers like Murali Vijay and Cheteshwar Pujara helped India to won the series by 3-0 and now India's eyes are on 4th test as well. On other hand young Australian team will be playing to save themselves from white wash by showing better performance this time. No Australian bowler has shown extra-ordinary performance so far in this test series. In batting department only Michael Clarke given performances. these are two reasons of Australia defeats one after one. lets so who gives better performance in last test? Hosts completes white wash 4-0 or guests saves their respect by doing 3-1.